It took many months of patience and bidding attempts on eBay but I finally got my 2009 Topps Heritage Albert Pujols C10 Chrome Refractor. Amen. Thanks to Amy for trading that and a bunch of YSL cards for the 1954 Bowman Burgess card. Now for another card that I can cross off the want list that I never even put on there because I'm lazy. 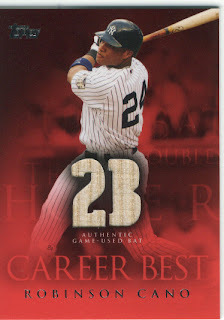 Dan over atSaints of the Cheap Seats was kind enough to send along a Career Best game used (so they say) bat card of Robbie Cano, which may complete the game used portion of Cano cards from 2009 Topps for me, I will have to check. I hope I can find something he might like, though I do think I have a little something to e-mail him about shortly. My last piece of mail was from eBay, and was quite the bargain. eBay sponsors an "eBay bucks" program that is offered to select members, it may be open to everyone now I'm not sure and I accumulated $3.82 or something like that. 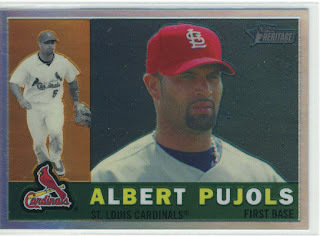 I found the 2009 Allen & Ginter N43 Albert Pujols for $4.95 free shipping as a buy-it-now and pounced on it. The card cost me $1.13 total, and I couldn't be happier because the rest can be used to be some other thing I don't need on eBay. Now onto big business... 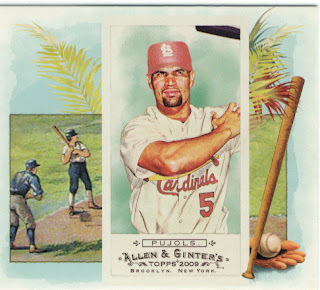 Does anyone have any Pujols from 2009 Allen & Ginter that they would want to trade me? I already have the mini, and mini black border as well as the N43. Let me know. I got the NP51 Pujols National Pride card today. Email me at natemedwards[AT ]legalarcade.com for a trade if you don't have it yet. well I guess the N43 I got for you can now be used as a bookmark, eh? Nathaniel, I will e-mail you shortly. I have the N43 of Pujols. Email me to set up a trade. National Pride and Highlights Sketch are already reserved for you. Will send them as soon as I get around to finding out if you require any of my Canos, Hughes', Martins, Linds, & YSLs.